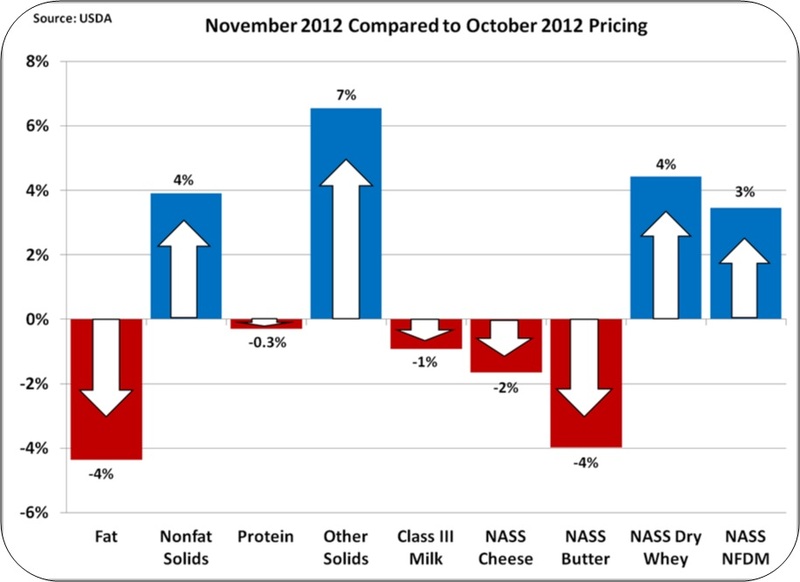 October Class and Components Milk Prices were announced on November 1st. 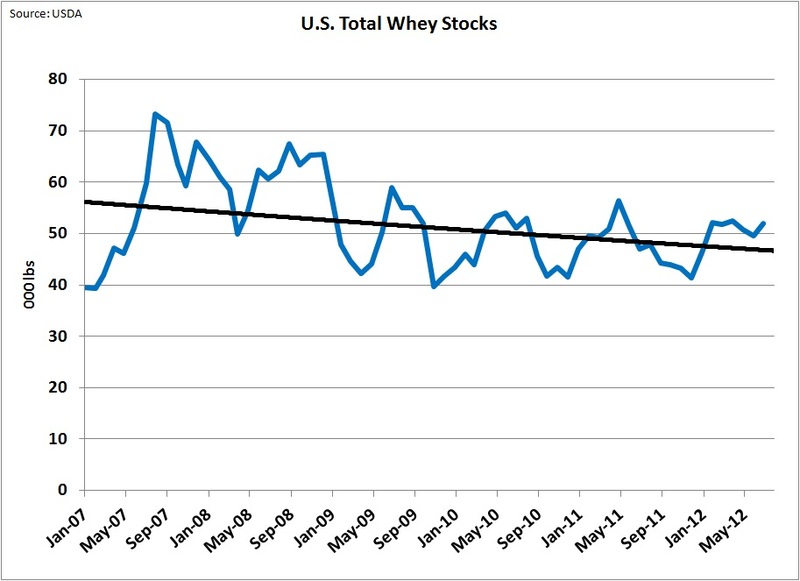 The increases met all expectations with significant increases in all parameters, especially the most important one, protein. Milk protein increased $.48/lb as cheese prices increased 10% and butter prices increased a smaller 5%. 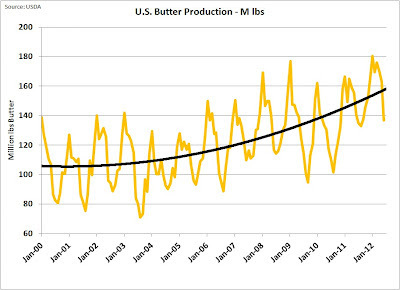 See the August 8, 2010 post to this blog for an explanation of this formula driven relationship. 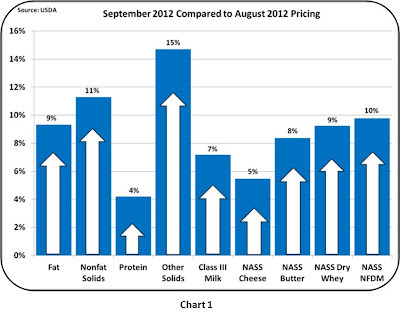 Chart 2 illustrates the magnitude of the protein increase. Milk protein reached exceptional highs in 2008, driven by unusually huge exports. 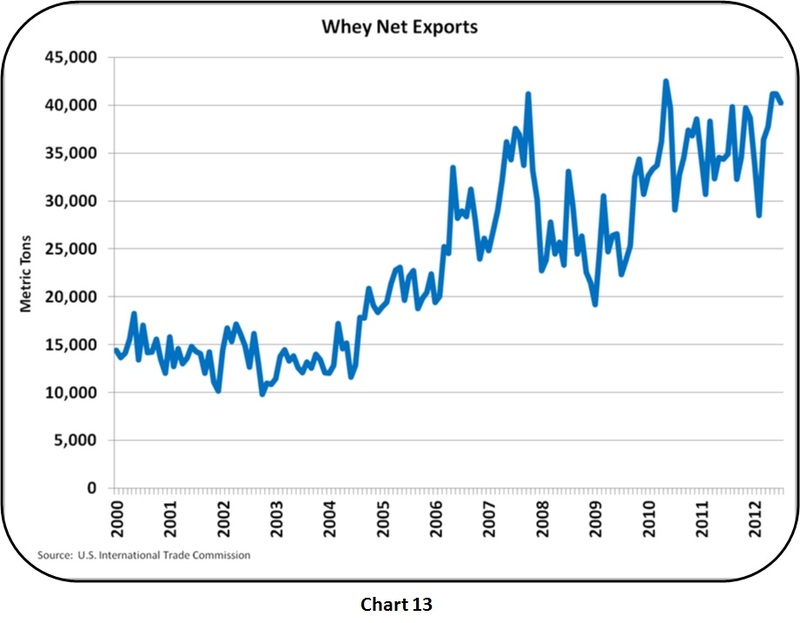 Exchange rates are again impacting exports and keeping demand high. 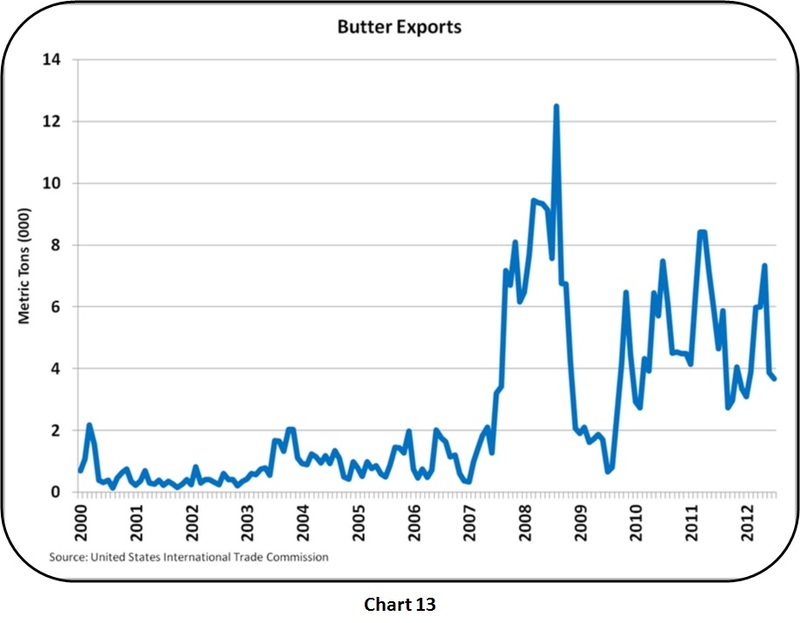 Currently there is a big difference because, in addition to favorable exchange rates, export programs that will have a long term impact are also driving higher exports. 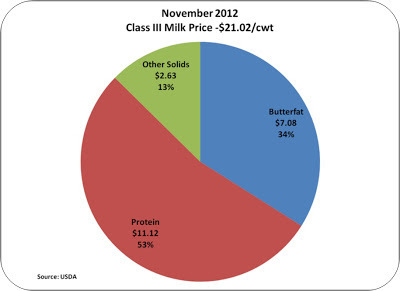 Milk protein made up 53% of the milk check in October (Chart 3). 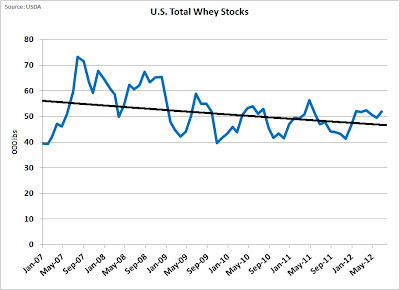 Clearly, a producer trying to maximize revenue must do everything he can to maximize protein volume from his cows. 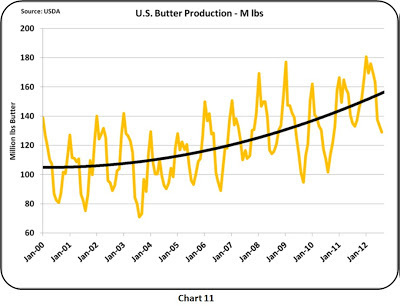 An increase of .1 lbs of milk protein per cow per day will increase revenue by $.37 per cow per day. For a producer with 1000 lactating cows, this represents additional revenue of $135,000 per year. 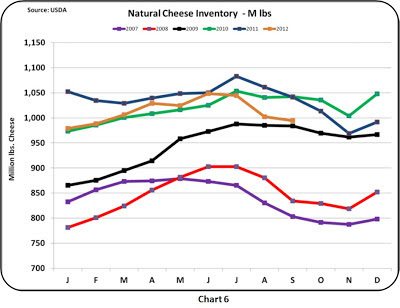 Although milk protein and cheese are the big news, in the sections below, "Other Solids" will be analyzed first. 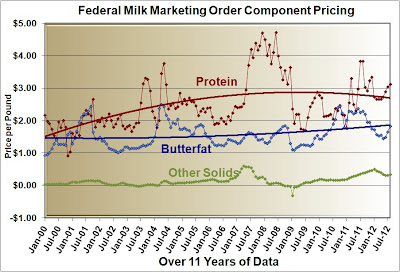 Other Solids prices are based on the dry whey price. While inventories are low, causing the higher prices for dry whey, the production of dry whey cannot react to this shortage because the availability of dry whey is totally dependent on cheese demand. 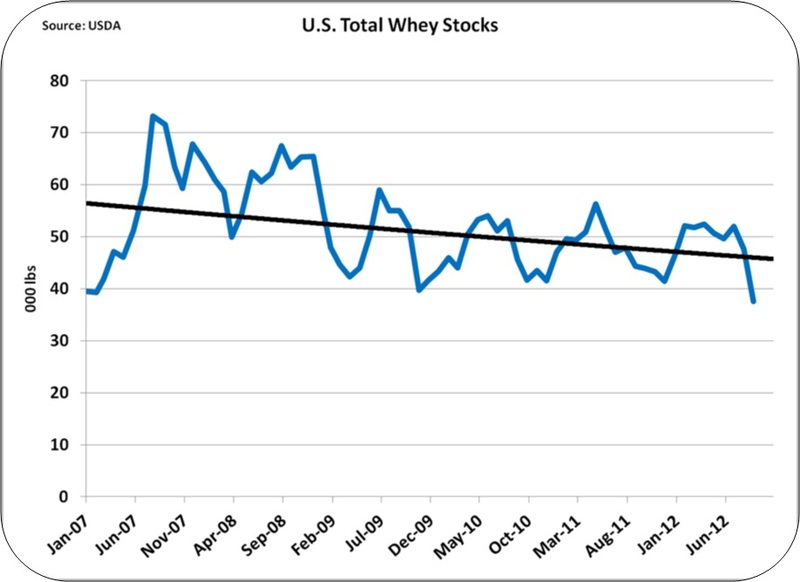 Dry whey is the by-product or maybe the co-product of cheese manufacturing, but no one makes cheese just to get the whey. 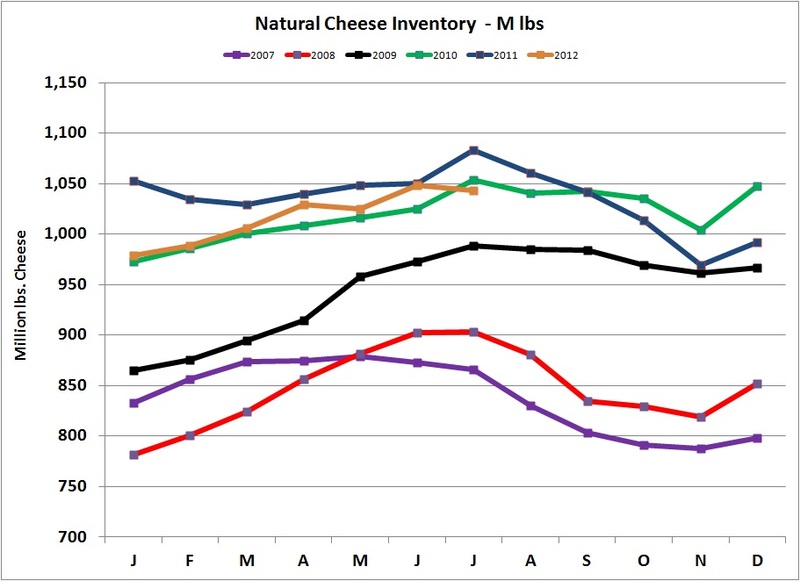 The demand for cheese drives the availability of whey. is a food grade product with relatively high protein (the non-casein proteins that do not remain in cheese pass on to the whey). 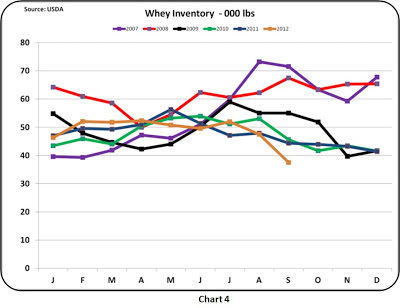 There is a high lactose content that gives whey a very sweet taste. Typically it is low priced. All these factors make whey an attractive product for use in human foods and animal feed. Whey exports (Chart 5) remain at record levels. 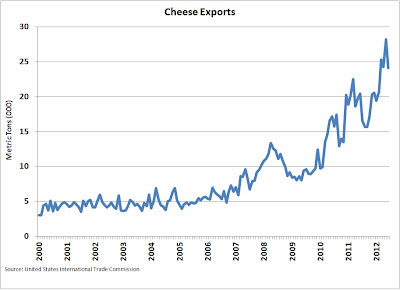 These exports have more than doubled over the last 10 years. 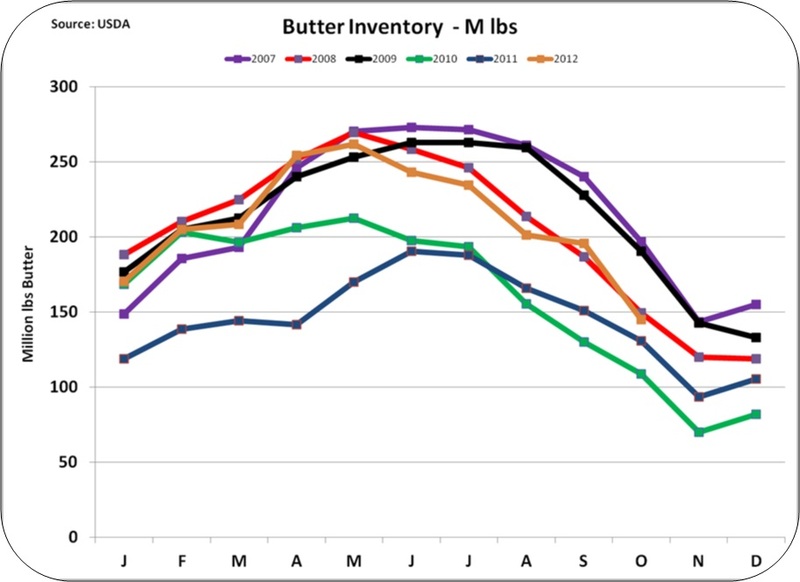 Typically, Other Solids have not been much of a factor in the Class III Milk Price, but this may be a long term positive change. In October, Other Solids made up 12% of the milk check or $2.47 per cwt of milk. 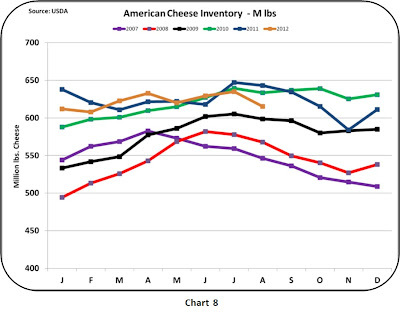 Cheese prices are the real story for the month of October. 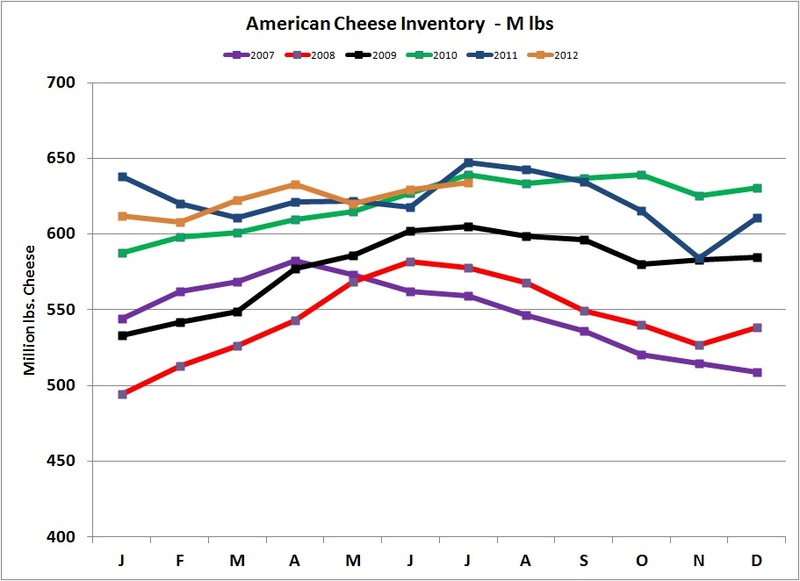 Inventories of cheese are lower than they have been since 2009 in spite of significant increases in production and demand. 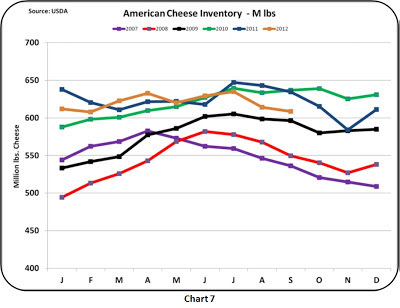 The low inventories are keeping cheese prices near record levels. 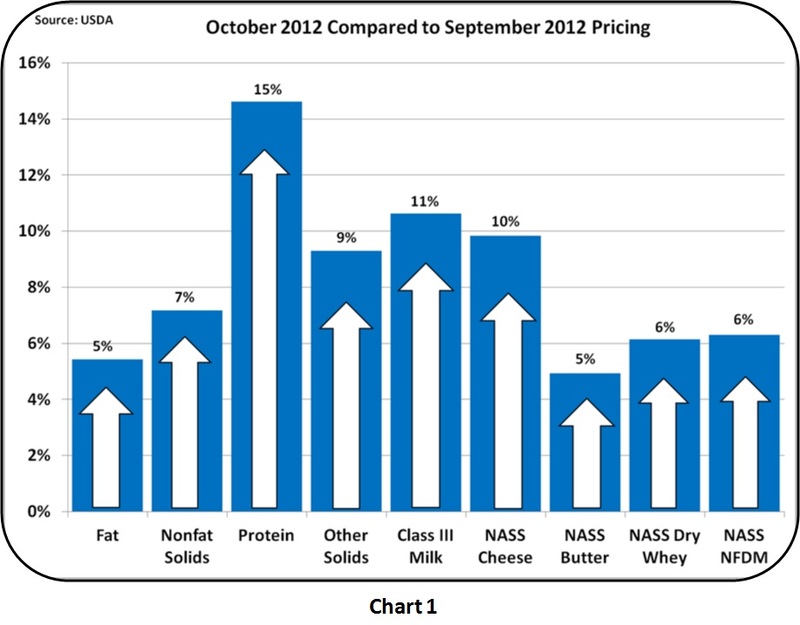 Chart 8 shows the NASS prices ending with the October average price. 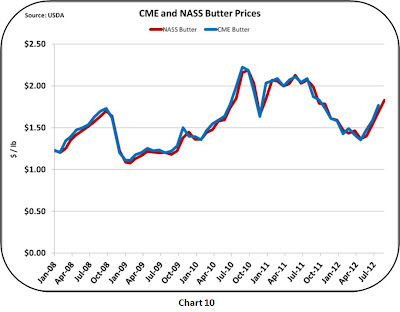 CME prices are typically about two weeks ahead of the NASS prices and as of early November, the CME prices maintaining prices above $2/lb. 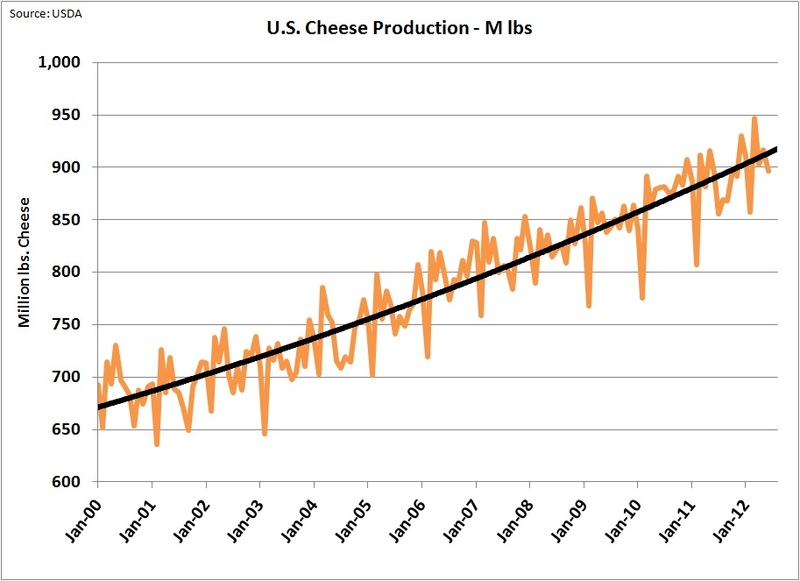 The production of cheese continues its long term trend of increases. 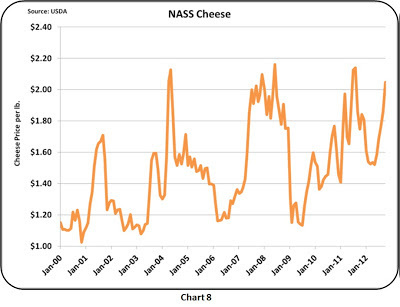 Cheese is continuing to increase its dominance of the U.S. dairy industry. 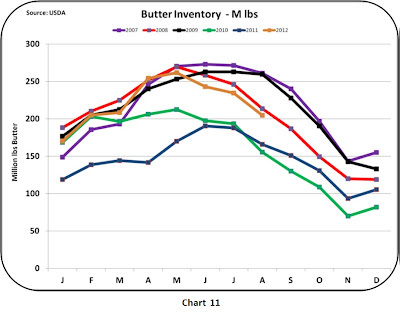 Butter inventories remain tight, but not as tight as in 2010 and 2011. 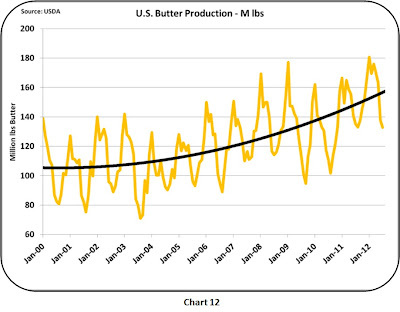 Butter production continues it growth which started in 2006. 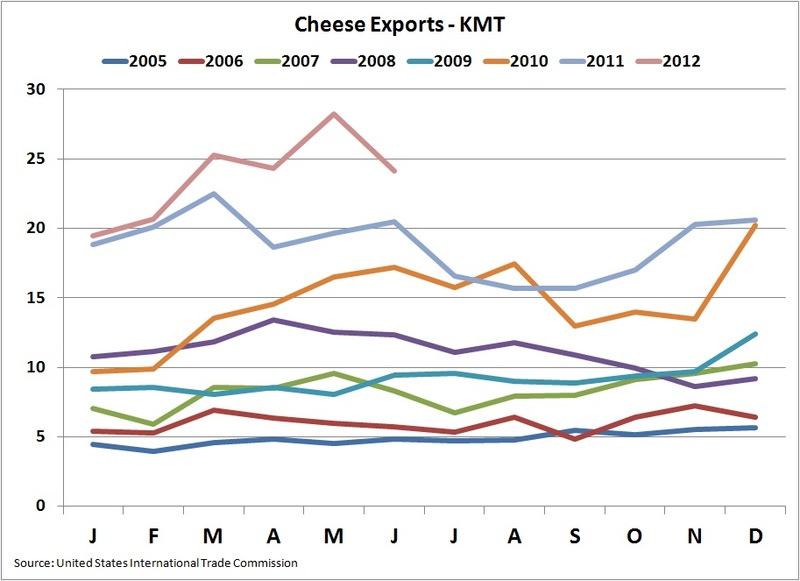 This growth in demand is really fueled by exports (Chart 12) which remain robust, but do not show much current growth. 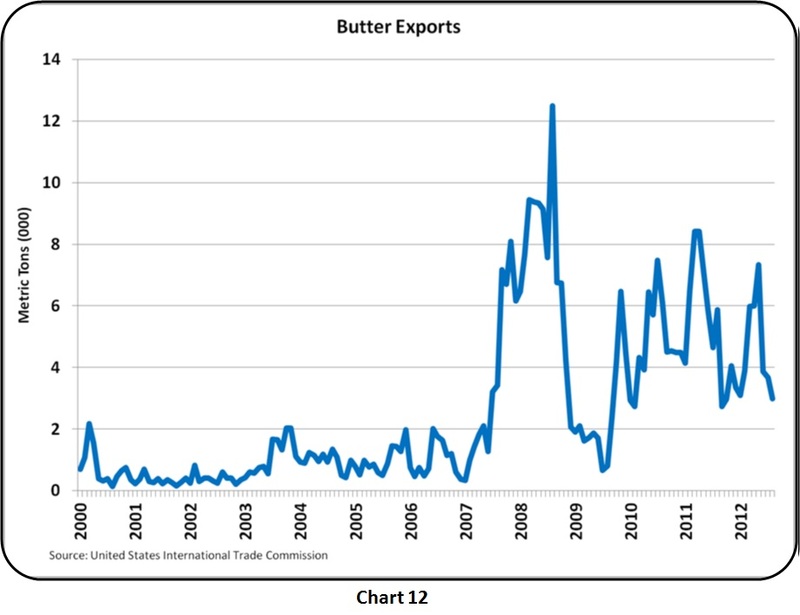 Exports represent about 7% of butter production. 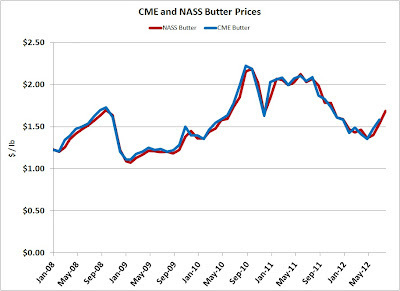 Butter markets are reaching an equilibrium, which will probably result in a softening of butter prices. 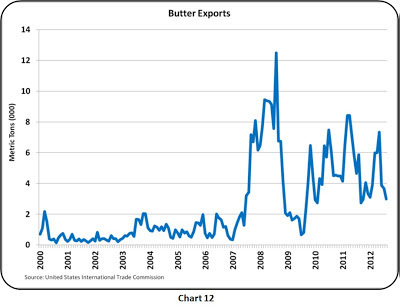 Fortunately, the price of butter does not have a large impact on the Class III Milk Price. 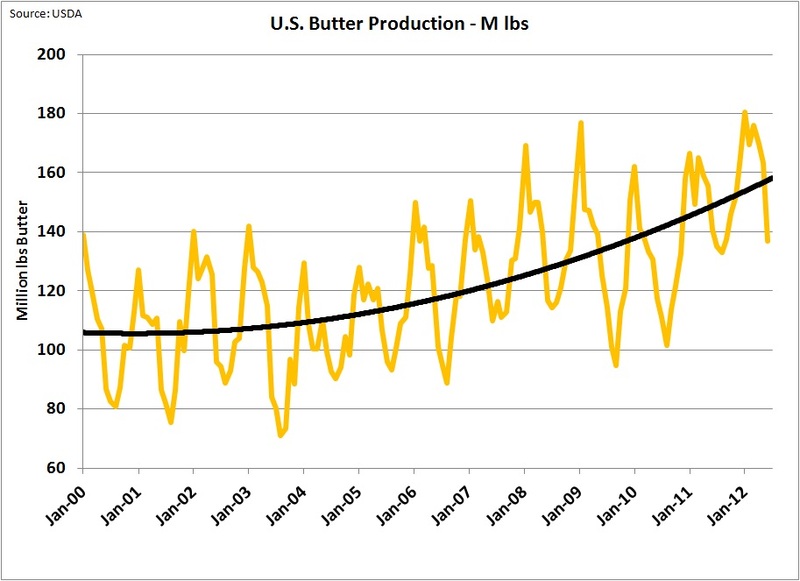 The math behind this is explained in the April 23, 2009 post to this blog. 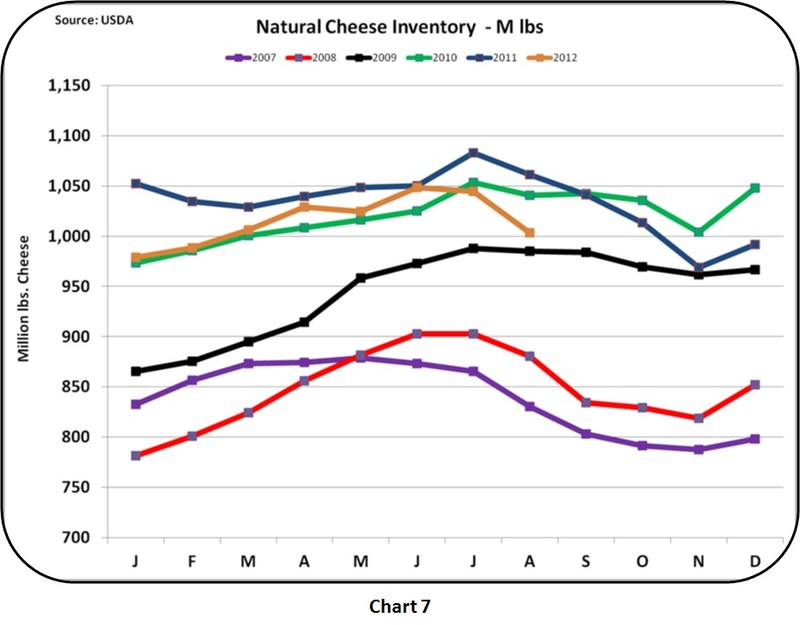 The rest of 2012 looks very good. 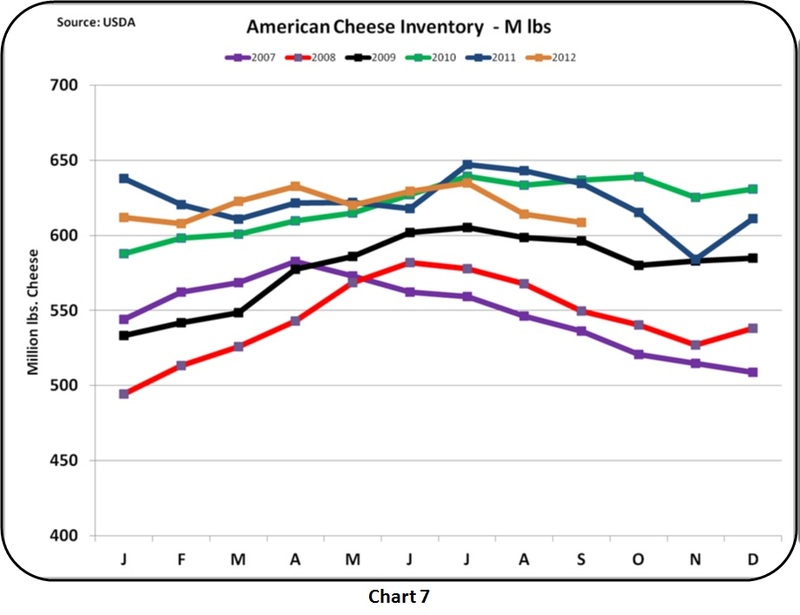 The increased price of cheese to over $2/lb appears to be holding and can be expected to maintain the Class III Milk Price above $20/cwt for the remainder of 2012. Although the futures market is not expecting the price to stay above $20/cwt in 2013, there is good reason to expect the above $20/cwt prices to continue into 2013. On October 3, September Class and Component Milk Prices were announced. Class III prices were exactly $19/cwt up $1.27 from the prior month. 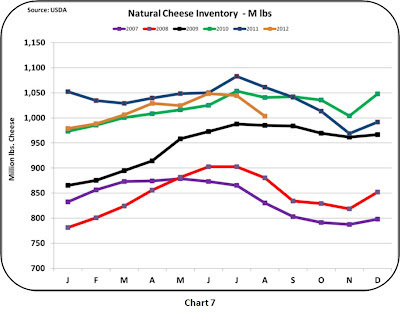 During the last month, prices for cheese, butter, and dry whey have moved up rapidly, positively impacting all the dairy financial statistics concerning milk revenue. 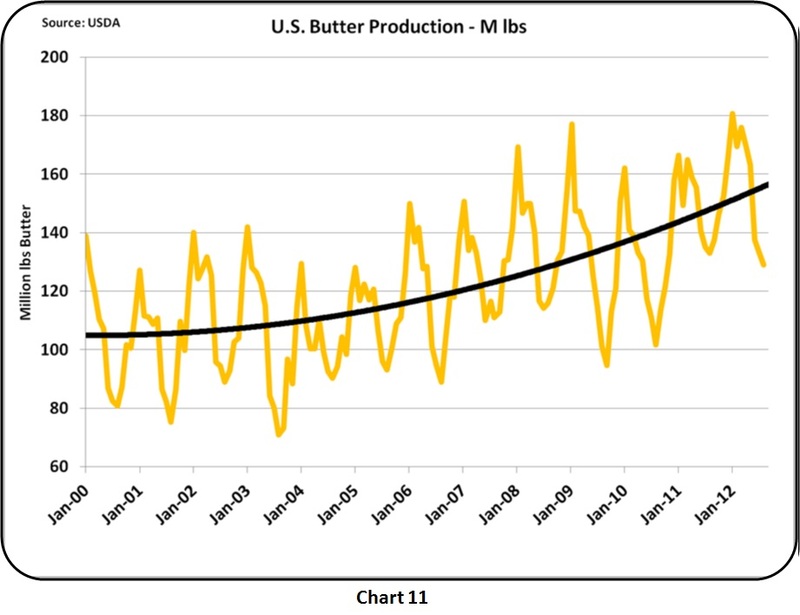 The increases are positive for improved dairy cash flow, but high dairy milk prices can also have a long term negative impact on consumption. 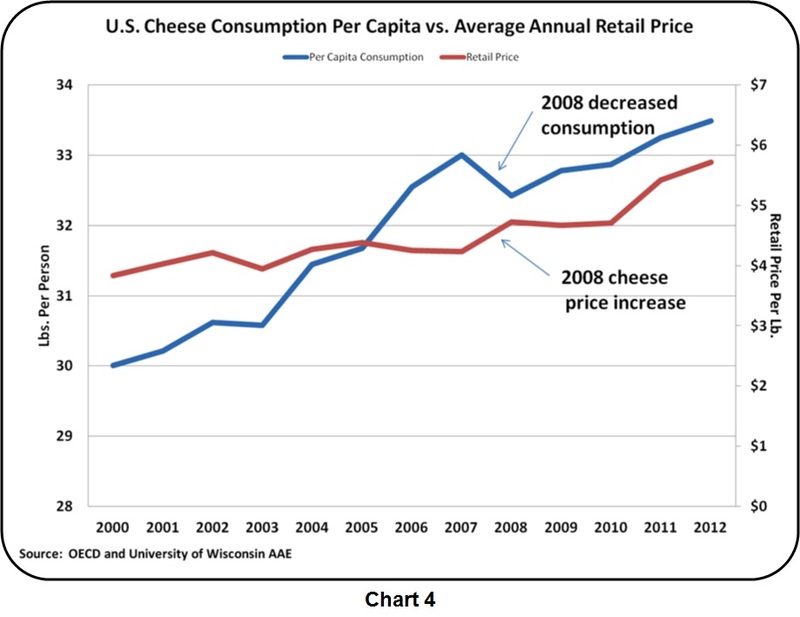 The first section below analyzes the impact of high milk prices on retail cheese prices which in turn negatively influence consumption. 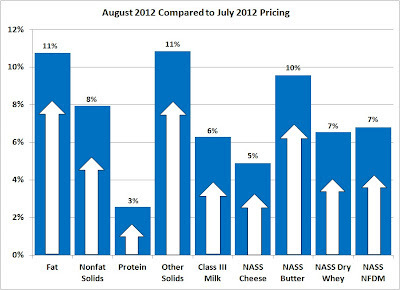 The 8% increase in butter prices vs. the 5% increase in cheese prices held protein to only a 4% gain. 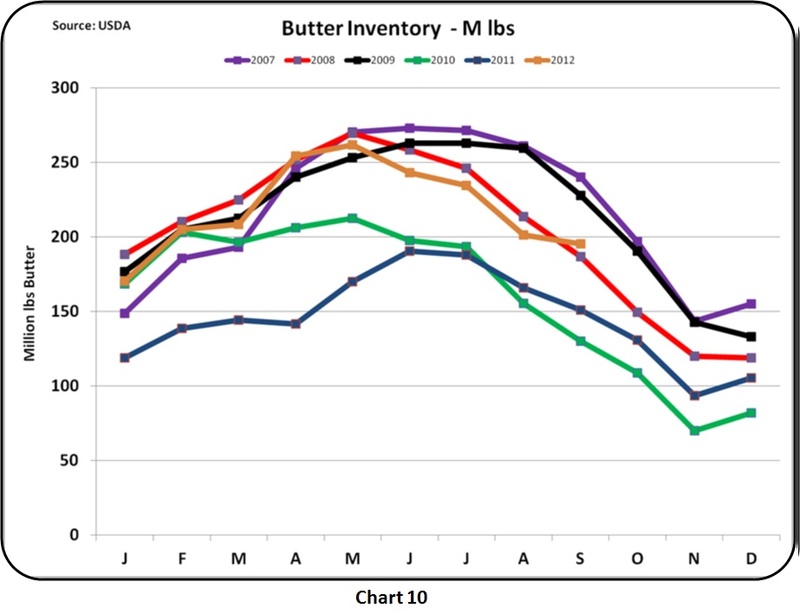 This relationship can be reviewed in the August 8, 2010 post to this blog..
All three component prices are running above their historic levels. 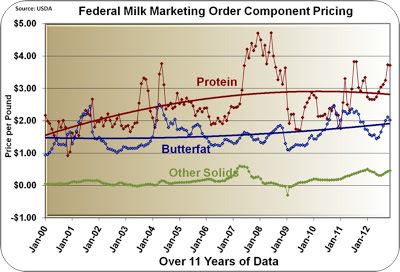 As Chart 2 shows, the value of other solids is becoming a factor. 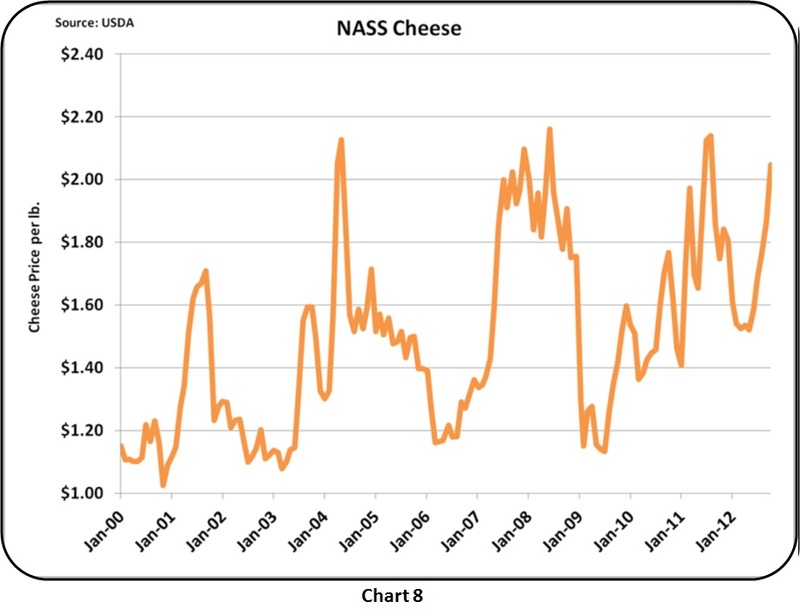 The other solids value is calculated based on dry whey prices and is therefore linked to cheese production and whey demand. 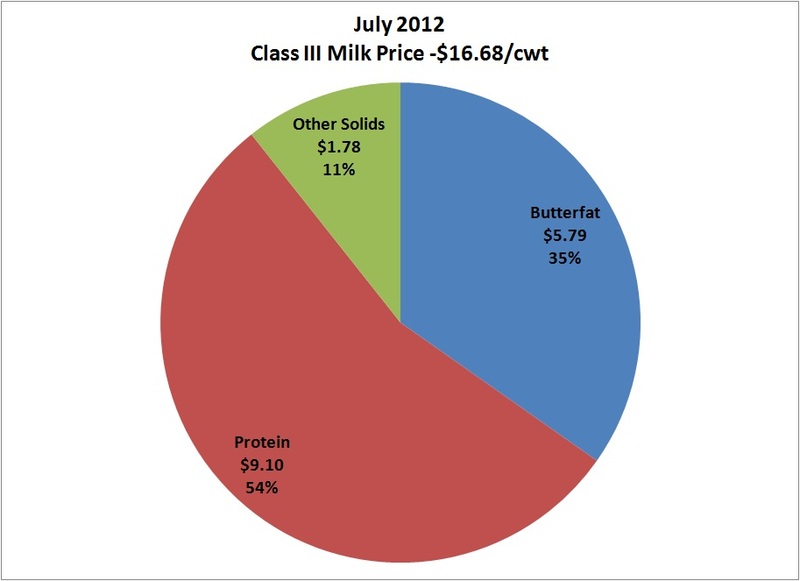 Payment for protein remains the dominant part of the milk check. 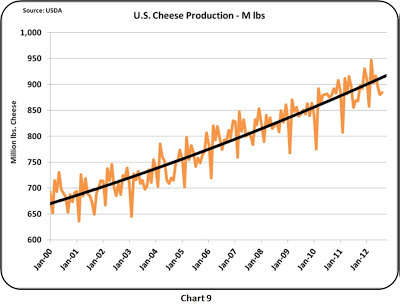 This relationship has been consistent for a long time and reinforces the growing importance of cheese as well as the need for higher levels of milk protein. 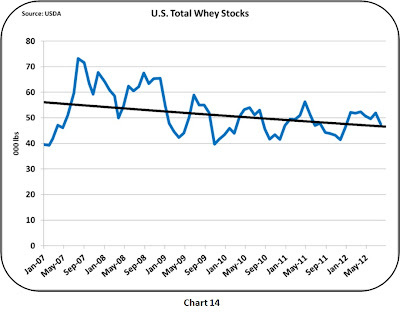 The producers' best strategy is to do everything possible to increase protein production. 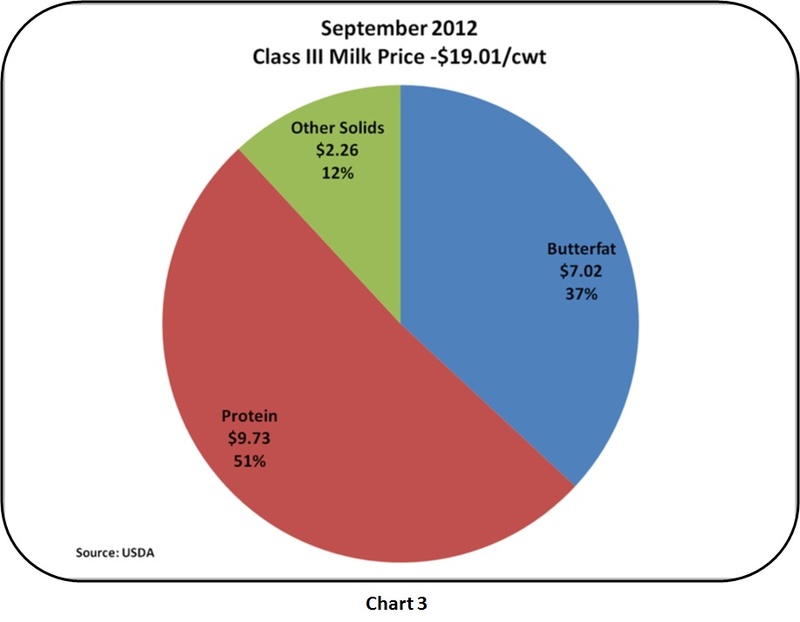 Why is $20/cwt milk not good for the dairy industry? 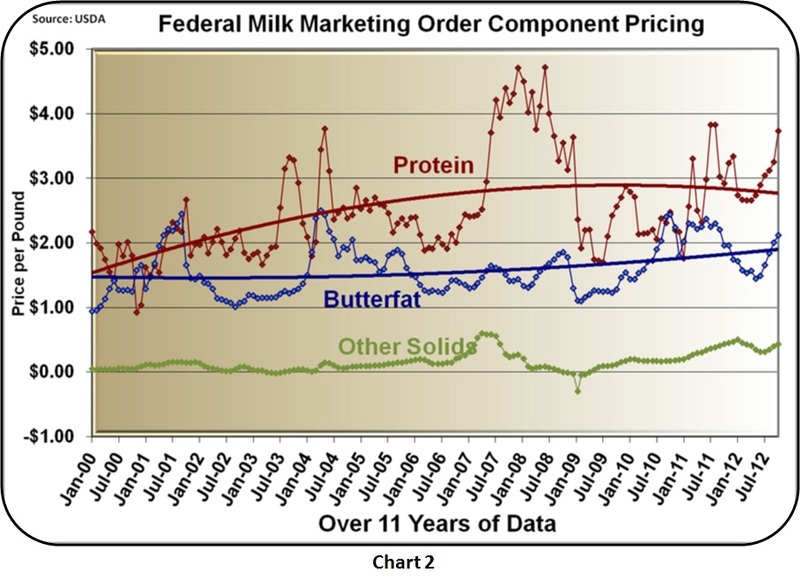 In 2007, when milk prices reached $20/cwt, producers received a nice bump in their revenue line. 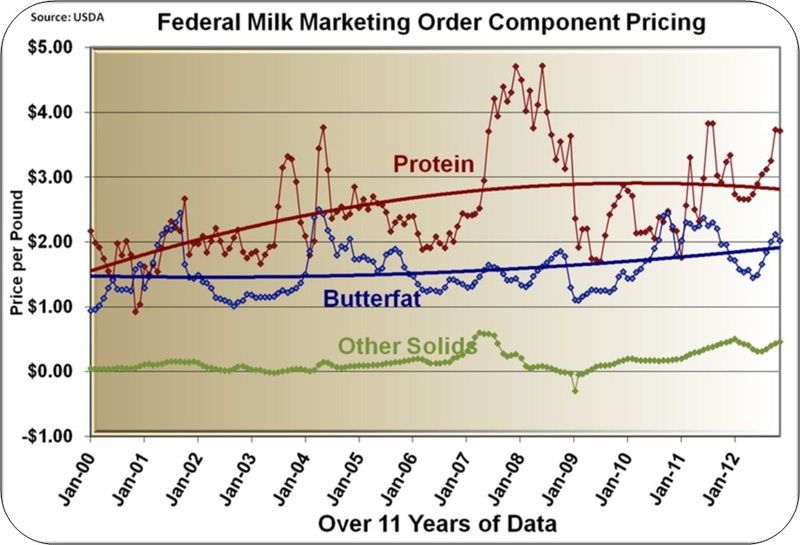 As we know, this was quickly followed by a severe drop in milk prices. 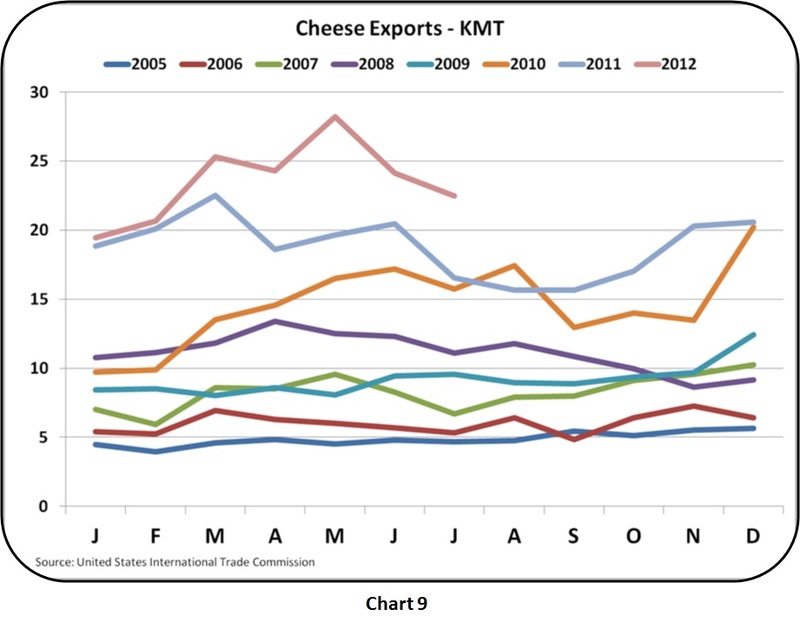 Part of this was the sudden changes in exchange rates which negatively impacted the U.S. export competitiveness, but there was also a negative impact on domestic consumption which decreased demand for cheese. 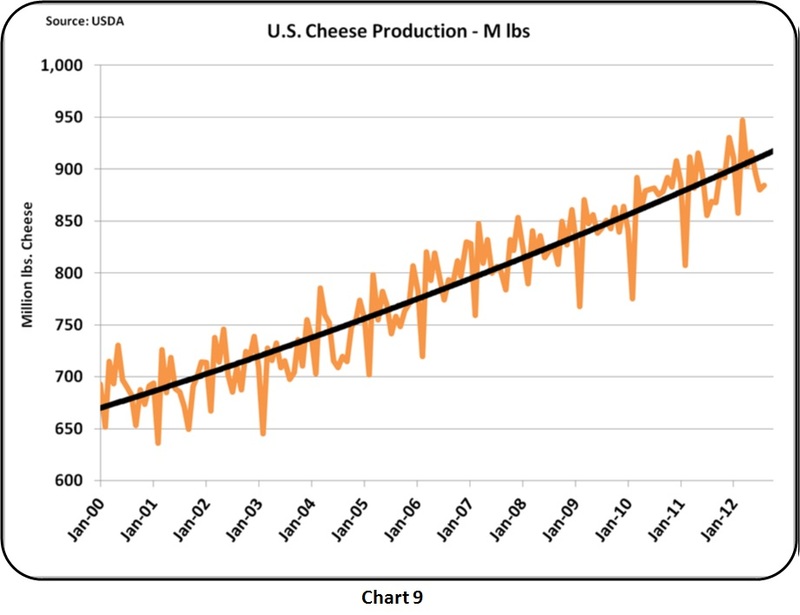 As can be seen in Chart 4, the high milk prices forced cheese makers to increase their prices which of course led to an increase in the retail price of cheese. 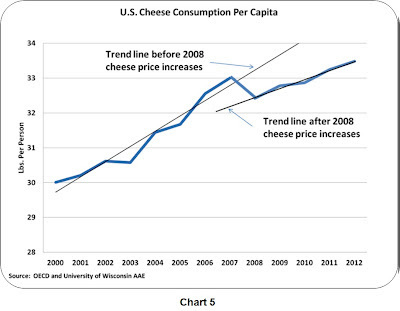 That increase resulted in a drop of 2% in per capita consumption which has never recovered. 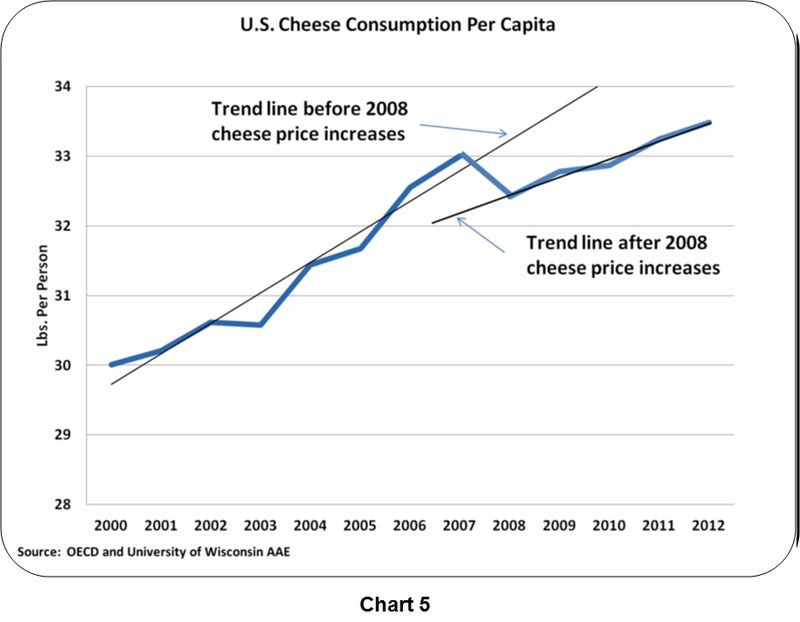 Following the 2008 drop in consumption, the long term trend of increasing cheese consumption continued but at a slower rate as illustrated in Chart 5. 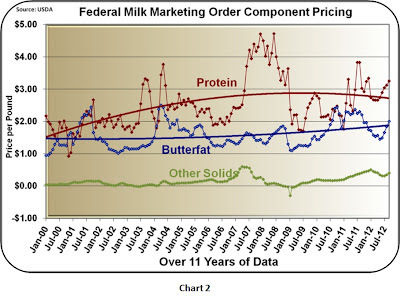 There have been additional price increases in 2010 and 2011. 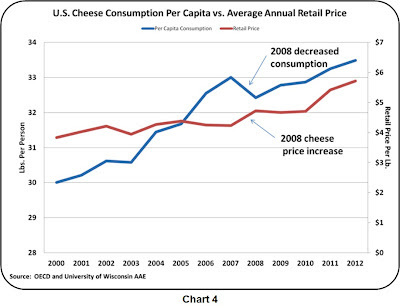 The drop in consumption and the slower growth rate now account for a 5% decrease in domestic consumption as compared to where consumption would be if the growth trend prior to 2007 had continued. 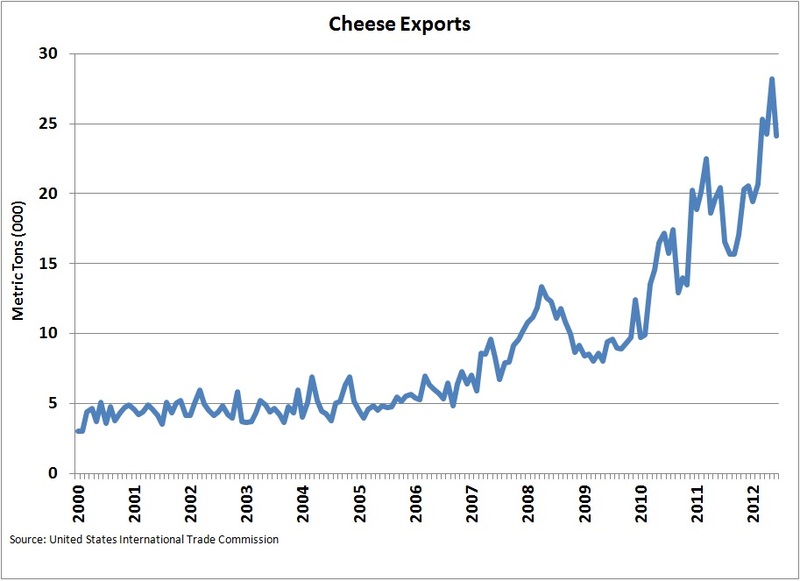 The conclusion is obvious. 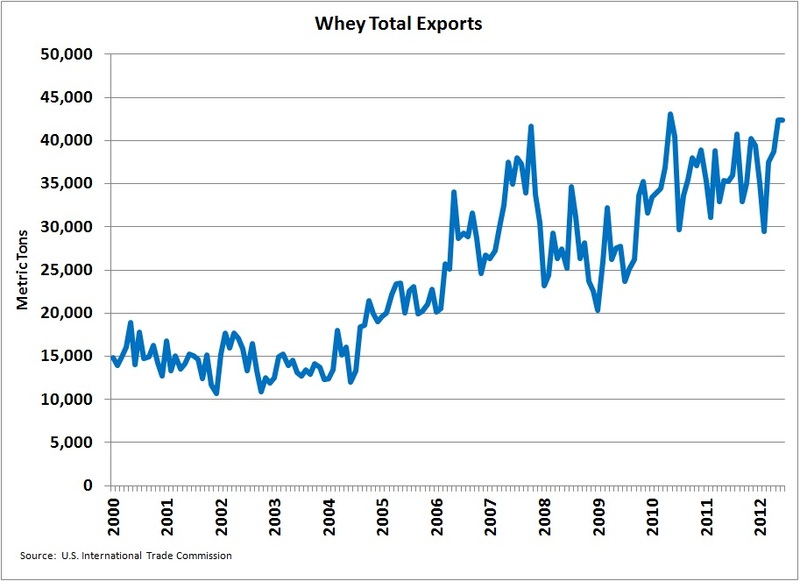 High prices for milk will dampen demand in the long term and therefore hurt long term demand for dairy products. 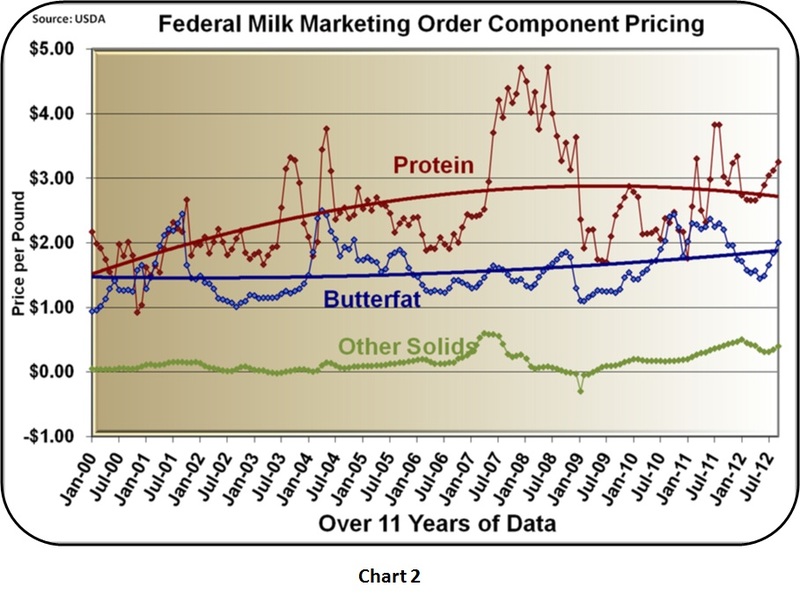 This leads to increased volatility in milk prices. 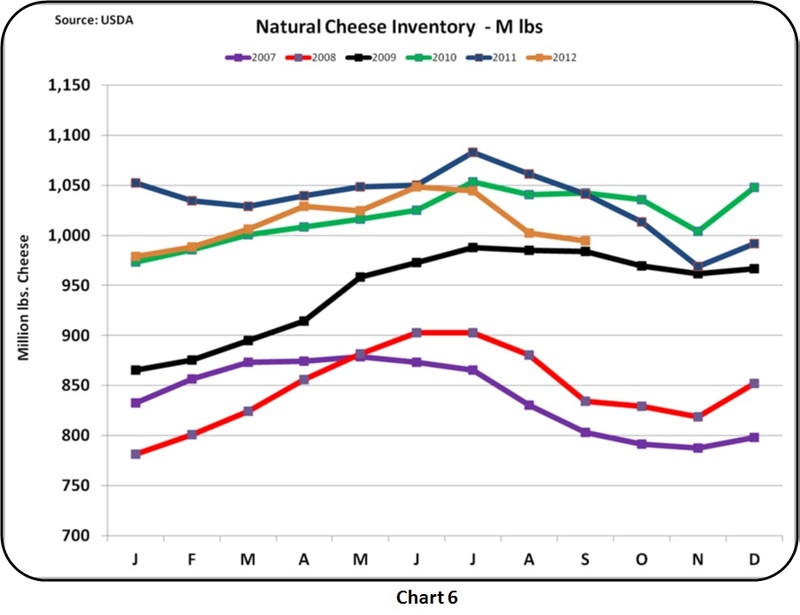 Because the price of Class III milk is linked closely to the price of cheese (see blog post for April 23, 2009), everything that influences the price of cheese directly influences the price of milk. 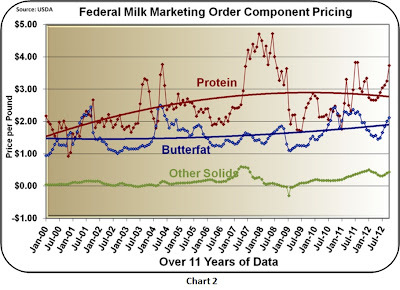 The remainder of this post covers movements in the parameters that determine the price of milk (August 8, 2010 post). The most impactful is cheese, followed by butter, and dry whey. They will be reviewed in that order. 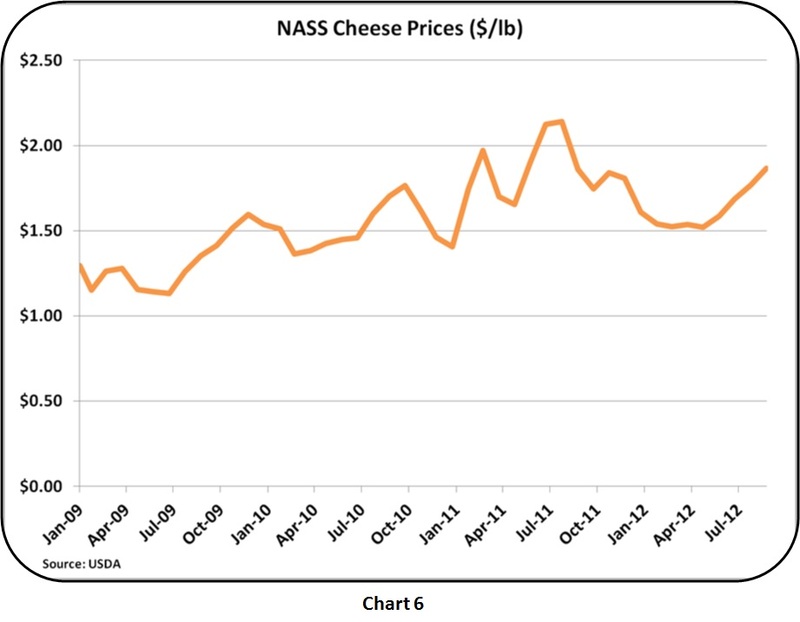 The NASS cheese price for September was $1.86/lb, an increase of $.10 from the prior month. That is certainly not a high, but the early October prices on the CME are approaching record highs, with cheese blocks reaching $2.09/lb. 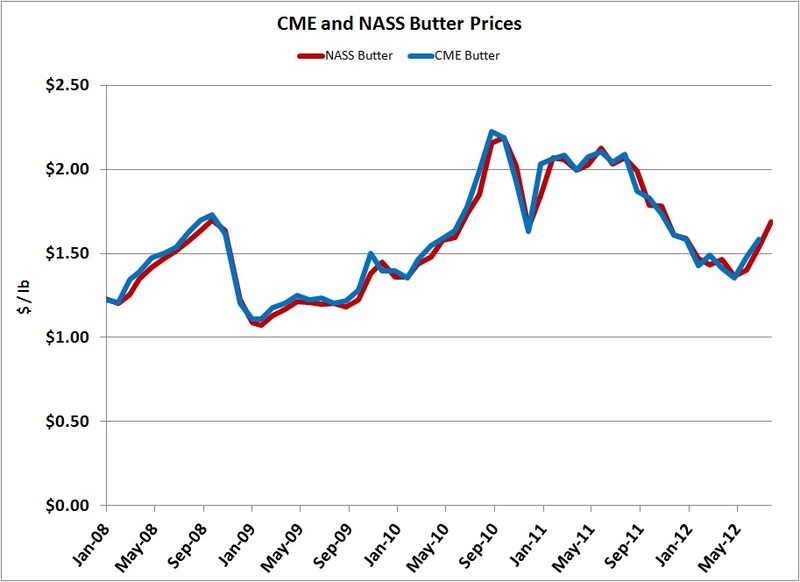 The NASS prices typically follow the CME prices with about a two week lag. 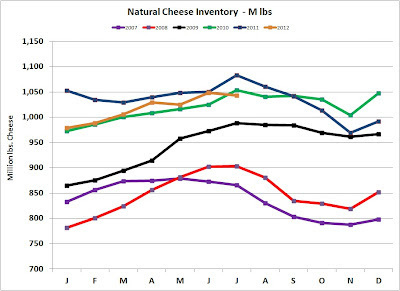 This relationship was covered in the October 2, 2011 post to this blog in the cheese section. 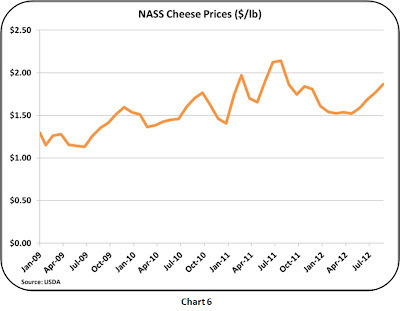 Based on current CME prices, it is likely that October will see another significant increase in cheese prices. 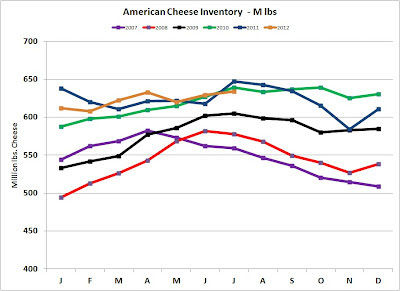 Inventories of cheese fell at the end of September. Charts 7 & 8 show this inventory drop graphically. 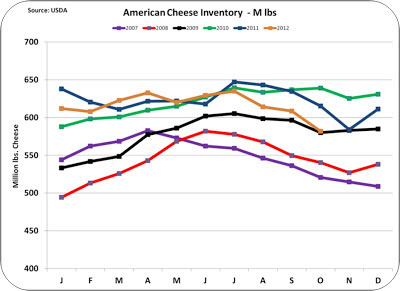 The tighter inventories will also be contributing to increased prices in October. 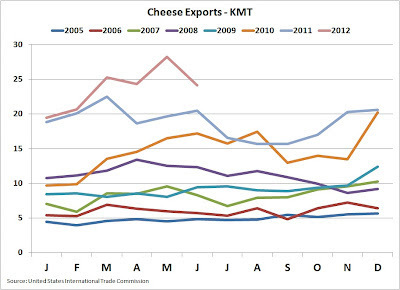 Unfortunately export data for August and September is not yet available. 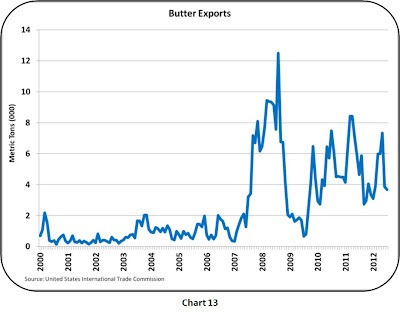 The export data through July shows record levels of exports. 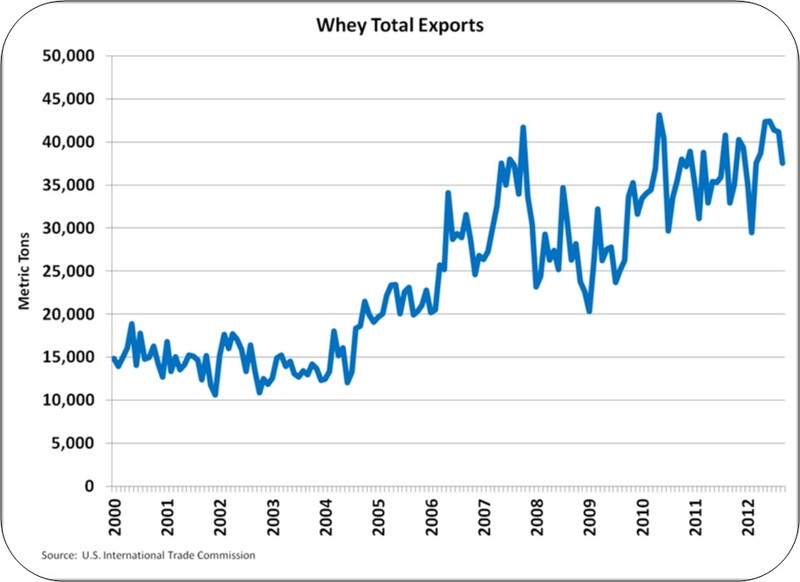 With a weakening of the USD in August and September, exports should be even higher than in the last reporting month of July. 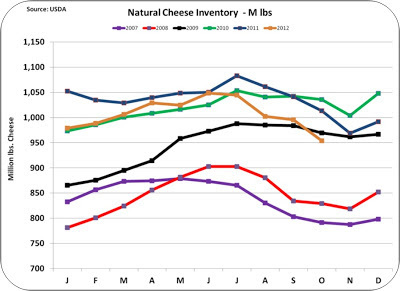 The near term future for cheese prices is very positive. 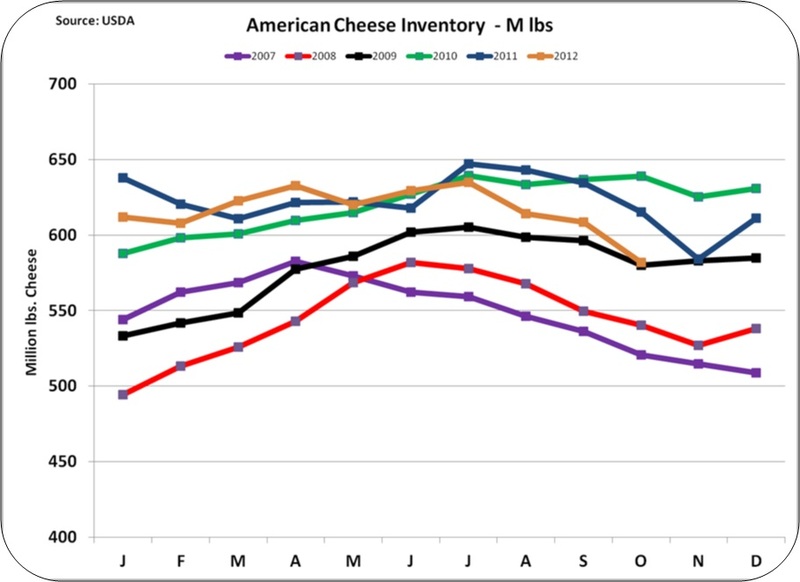 However, higher retail cheese prices are a concern because they will cause a future drop in demand. 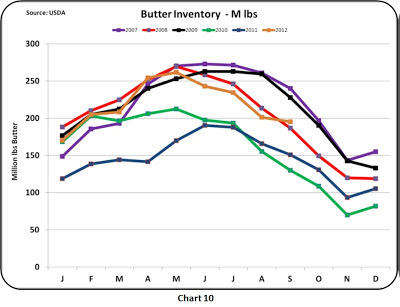 Butter prices for September were $1.83/lb, an increase of $.13 over the prior month. 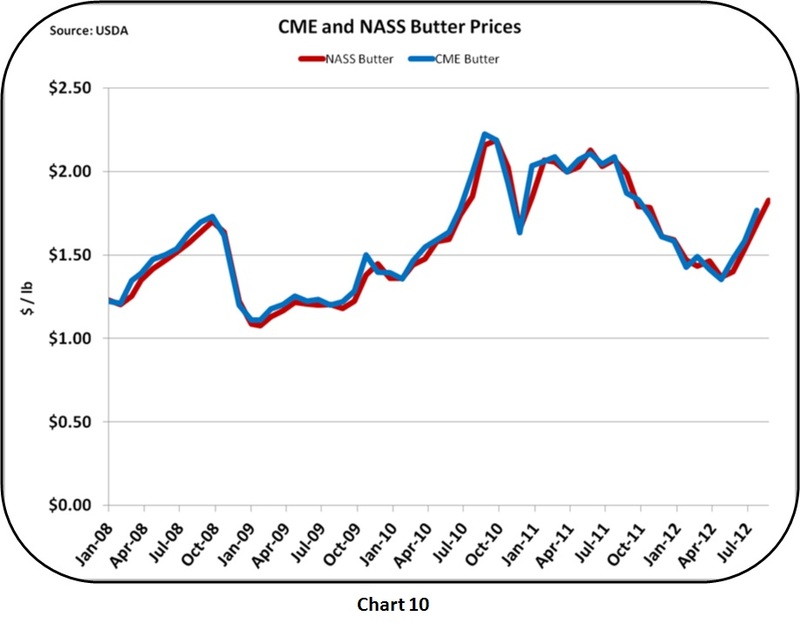 October prices on the CME are currently $1.91/.lb, so barring underlying changes, the butter price for October will probably show another increase. Butter inventories are continuing to tighten as shown in Chart 11. 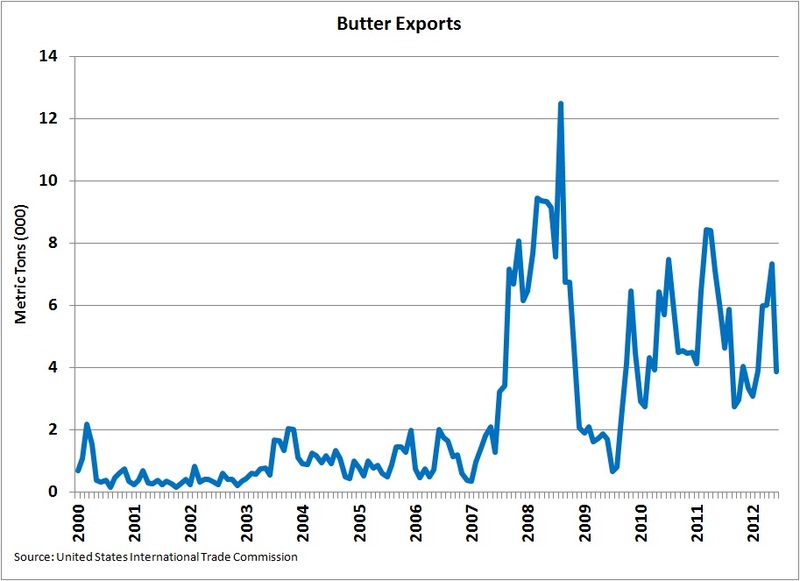 And butter production keeps increasing but can't seem to keep up with demand. 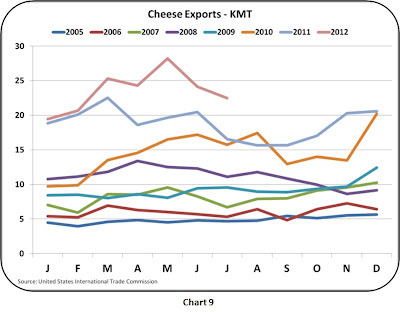 Exports are the drivers of increasing demand. 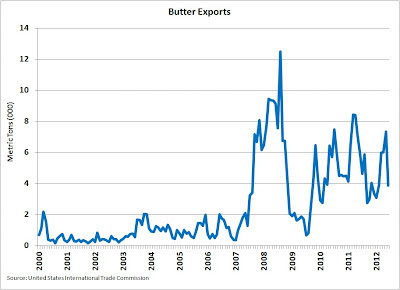 The very high levels of exports in 2008, caused inventories to be low and prices shot up as a result. 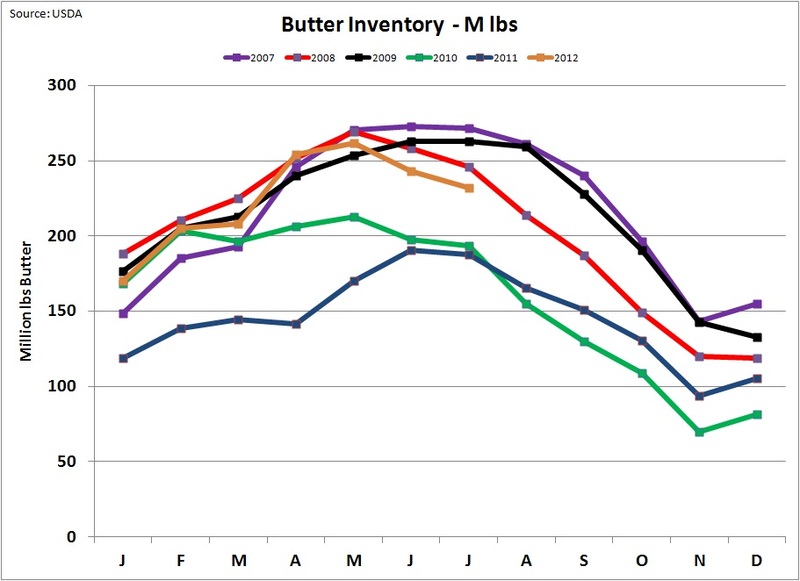 Inventories are again increasingly tight and spikes in exports may again deplete stocks. 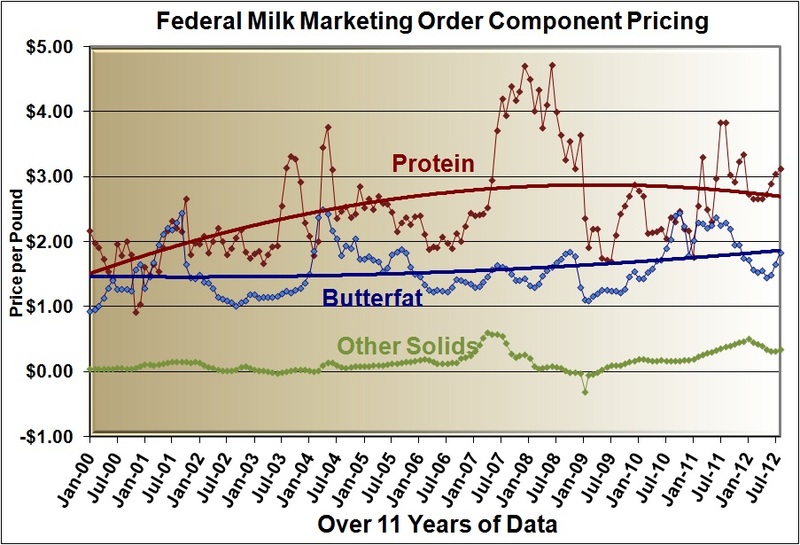 The price for other solids increased more than any other milk component. 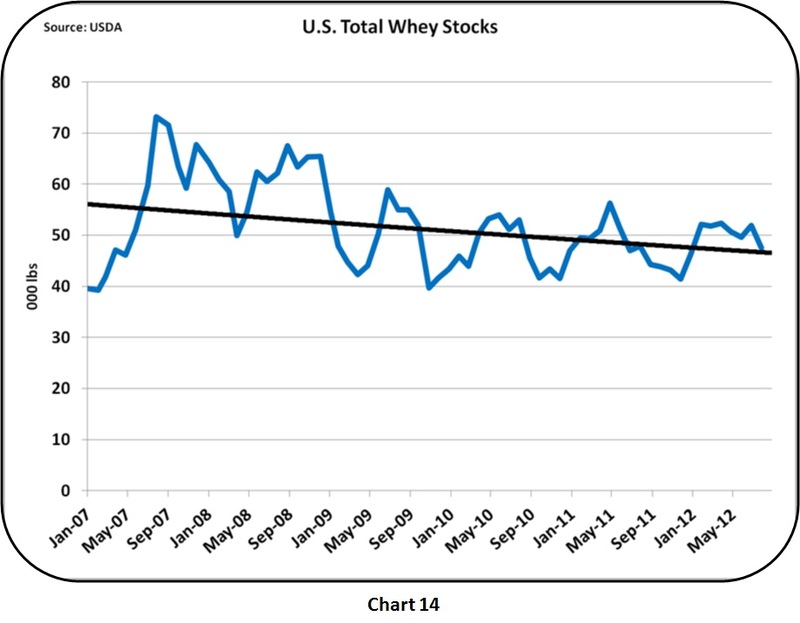 The 15% increase was driven by the price for dry whey which was up 9%. 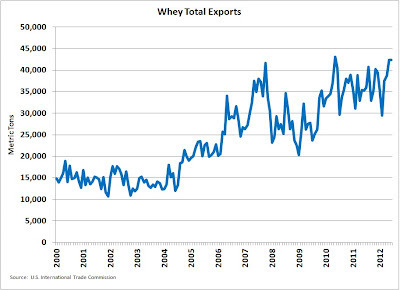 Whey exports remain high as shown in Chart 13. 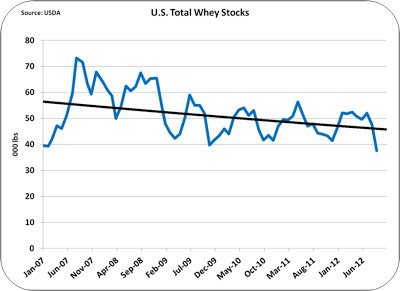 Whey inventories have been declining for 5 years putting upward pressure on the price of dry whey. As a result, the value of other solids has increased to a respectable $.40/lb. 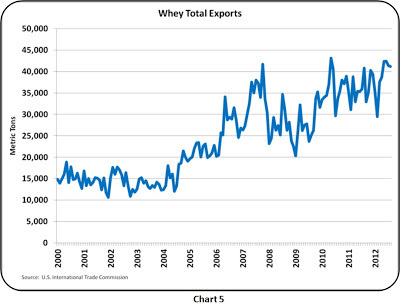 Exchange rates are favorable for exports, inventories of cheese, butter, and dry whey are low and the CME prices for all dairy products are increasing. It certainly looks like milk component prices will show additional increases in October. 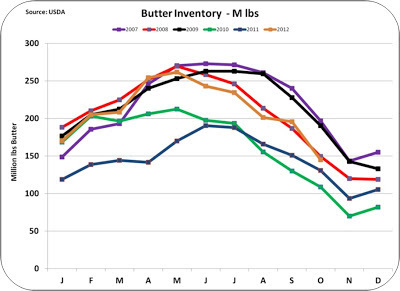 The current high feed prices will probably keep producer margins positive but not excessive. 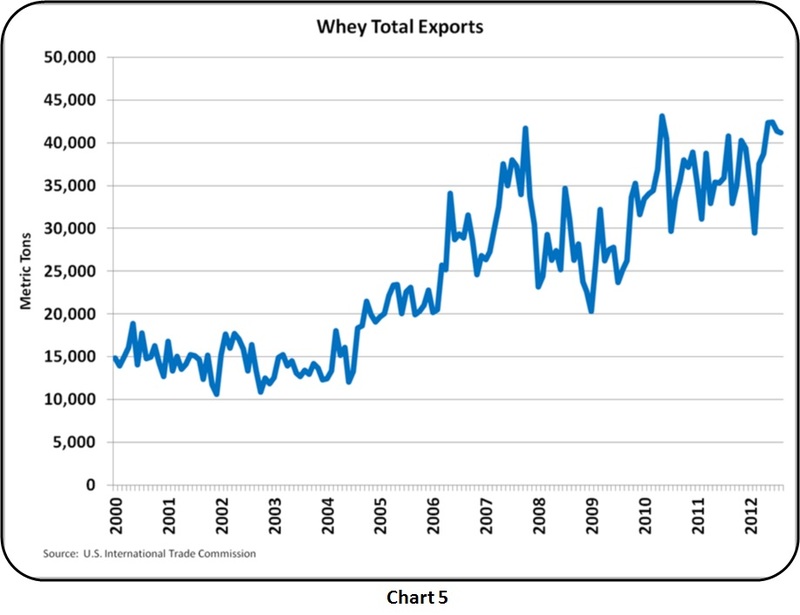 When prices reached $20/cwt previously, there was a significant increase in the number of cows which contributed to oversupply and very low prices the next year. 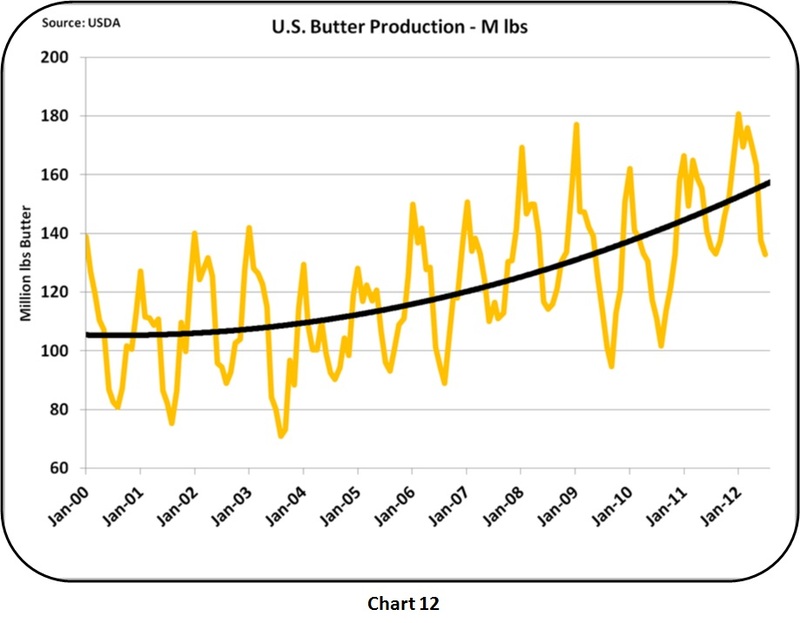 While high feed prices are not positive for the producer, they should have the impact of keeping cow numbers within reason.